If there is one thing my family is good at it is refusing to take a serious picture. We have no pictures where we're all politely smiling with our hair and makeup done and Sunday clothes. We have pictures where we act a fool or just have fun. 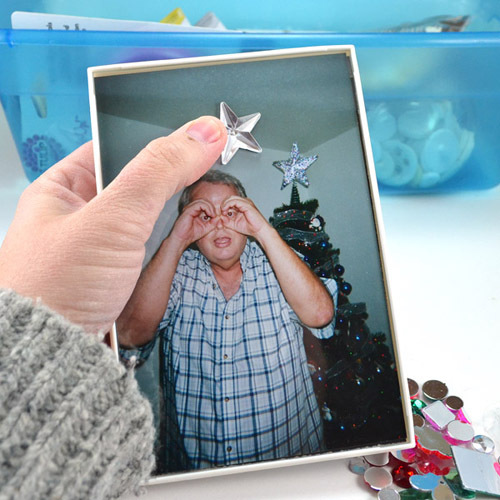 So I decided to bling up some silly frames for some of these silly pictures with Clear Gel Tacky Glue! 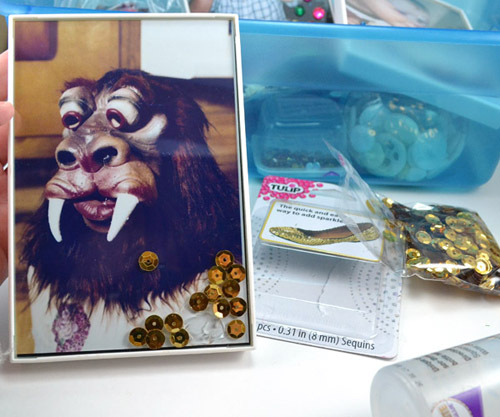 Grab your bottle of Clear Gel Tacky Glue and your box of bling. If you don't have a box of bling gather sequins and rhinestones and glitter and buttons and all sorts of fabulous and bling-y stuff! These frames came from Walmart in a package of 2 for $2. Since we're embellishing the glass, we aren't ruining our family photos. 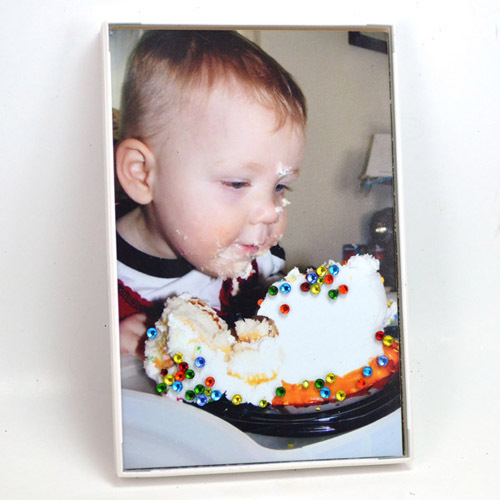 AND if you get frames with glass panes, you can scrape off your fancies when you decide it is time to swap out photos! Here is silly pic number one. That's my dad. 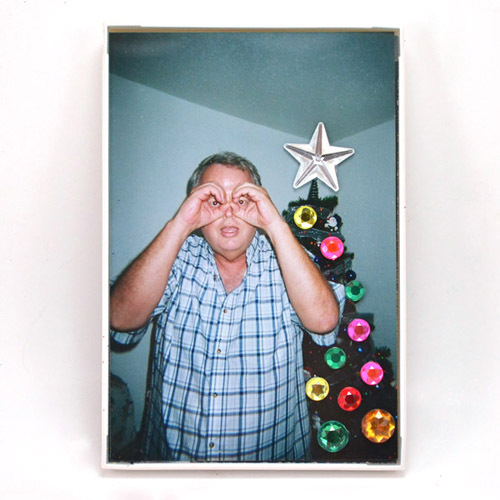 Actually, more accurately that's my dad making binocular eyes with his hands. This pic was snapped in the middle of a play session between my very normal father and a white boxer named Lolly. I dug through my stash and found a rhinestone star. Perfect! 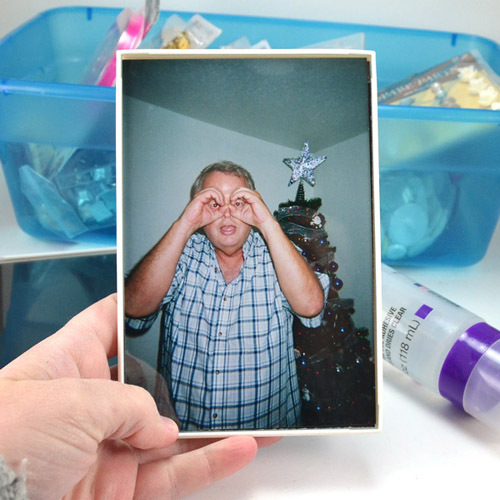 Using Clear Gel Tacky Glue, so that no glue would show over the photo, I started sticking down some rhinestone bling to doll up that tree behind the weirdo, erm... my father. A few rhinestones and this picture pops! I thought about glittering up the lips but that would detract from the awesomeness that is this mask. 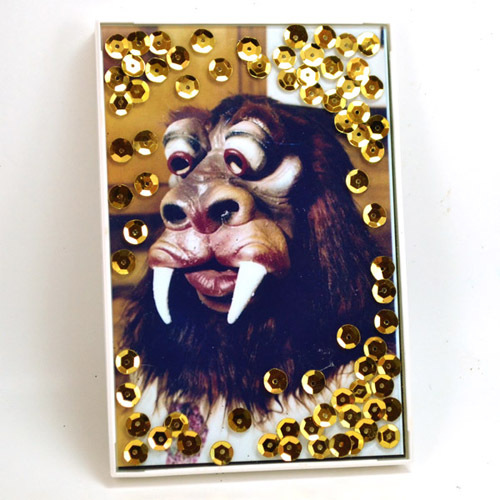 So instead I applied Tulip gold sequins all around the edge to pull focus in on this furry, tusked beauty. And now I have a pic of my Momma hanging out in the kitchen in "the mask" all blinged out! It was a big deal when my oldest nephew turned 1. He got his own cake that he was allowed to trash and smash and eat like a dog. And let me tell you, he did. This sprinkled cutie was amped up with just a few multicolored, sprinkle sized rhinestones. Now a cute picture is even cuter! 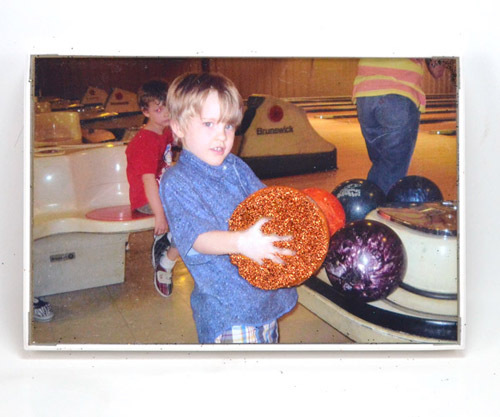 I used to love bowling. I was even on 2 different leagues! And one day my family decided to head into a tiny town and bust out the big balls. One was thrown high in the air (accidentally while granny bowling, mind) and we had a great time. 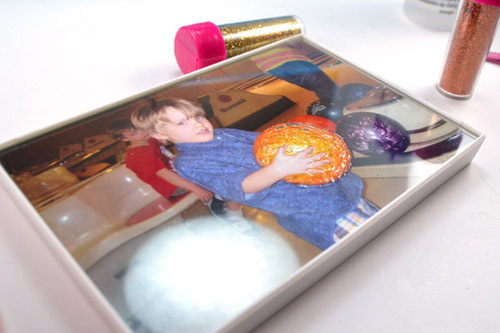 Since I've always loved this pic of my youngest nephew showing off his bright orange bowling ball, I decided it needed some of his favorite stuff in the whole world... Glitter and lots of it. 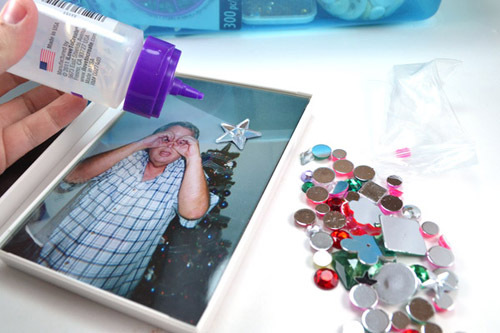 Sprinkle your glitter on AND LET IT STAY for several minutes or until the glue seems to be dry. 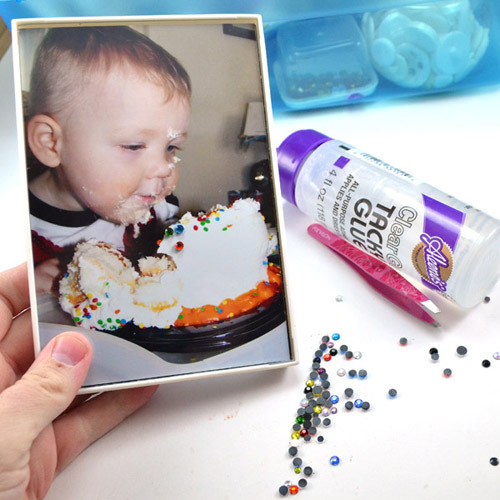 Scrape away anything that glued down in the wrong place. I used a pair of junk tweezers to help me clean stuff up. Look at that blinged out ball! 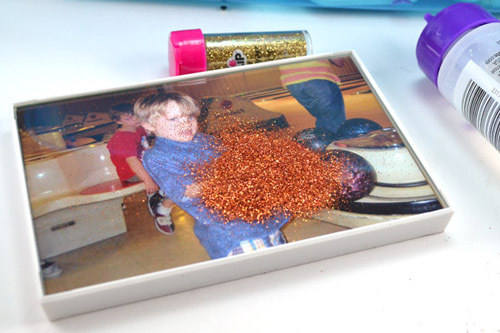 Munchkin loves hanging out with his family and loves glitter. I'm sure this will be a big hit especially because he also loves looking at his cute self. I think the most fun part was digging through family photos to find ones that looked like I could glam up. There were several that I would have loved to use but didn't lend well to the project at hand. 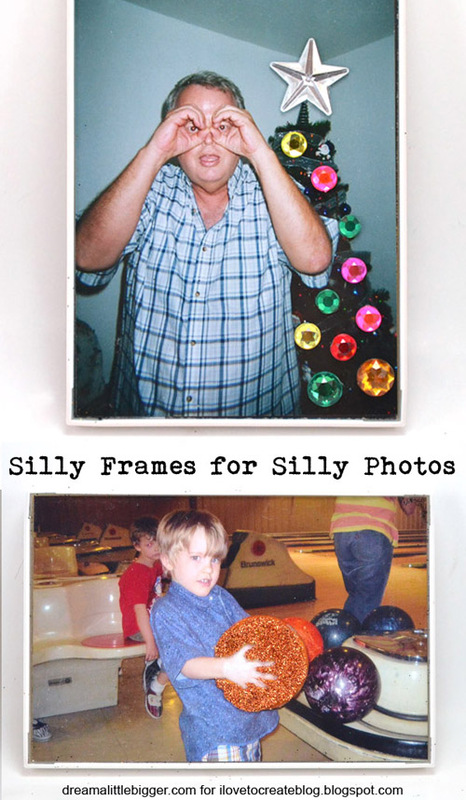 Now I have some silly family photos hanging out in some silly frames to make me smile! Consumers can also book new arrivals without picking up a phone or going to the store. Wearing replica watches are often a unique and trendy style for both ladies and gentlemen. Replica watches are copies of extremely costly watches. They certainly seem like rolex replica sale and make but are actually designed in another way with a cheaper price. When fake rolex sale is coming, what offers will you select to the do it your family. I think replica watches sale could possibly be your very finest choice as Christmas gives for your family. Our watches online store gives you a great possibility of high quality replica watches sale on sale. The 21st century is the electronic age where computer and cell phones are in boom. In every walk of life, we find their usage whether it may be business or entertainment. On the fake rolex sale seem to be replaced by cell phones or computers. One may even claim that timepiece is an outdated thing.